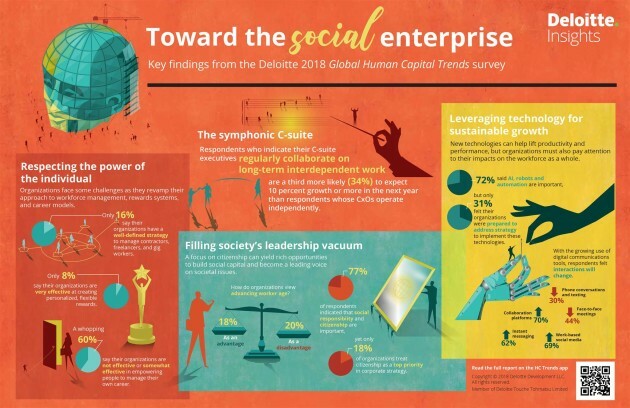 In Deloitte’s new report, called The Rise of the Social Enterprise, respondents point to a team-based, cross-disciplinary approach to tackling complex issues as the most important trend in Southeast Asia (SEA). More than 11,000 HR and business leaders weighed in, of which 199 respondents were from SEA. Results showed that companies where C-suite executives regularly collaborate are one-third more likely to be growing 10% more than companies whose leadership operates in silos. 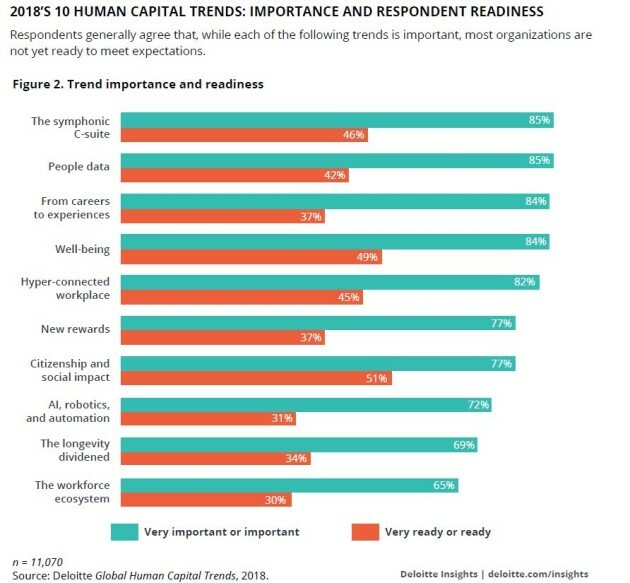 Apart from identifying the 10 most relevant HR trends for 2018, the report also checked in with respondents on their readiness for each of these trends (infographic below). The symphonic C-suite is a new leadership model in which an organisation’s top executives play together as a team while also leading their own functional teams. For the pace and complexity of the changes involved in today’s environment, and the high stakes of success or failure, trends and issues can no more be delegated or approached in silos. CHROs recognise the need to actively manage relationships with workforce segments beyond the enterprise. When asked to forecast the makeup of their workforce in 2020, 37% expected a rise in contractors, 33% foresaw an increase in freelancers, and 28% expected growth in gig workers. While companies recognise that employees are asking for more personalised, agile, and holistic rewards (including fair and open pay), only 8% report that their rewards programme is ‘very effective’ at creating such solutions. On their agenda should be the development of a holistic variety of rewards, matched to individual preferences, across diverse talent segments and on a continuous basis. Instead of a steady progression along a job-based pathway, leading organisations are shifting toward a model that empowers individuals to acquire experiences as well as new roles, to continually reinvent themselves. However, 59% of survey respondents rate their organisations as not effective or only somewhat effective at empowering people to manage their own careers. Progressive organisations see extended longevity and population ageing as an opportunity – 20% of respondents said that they are partnering with older workers to develop new career models. Doing this would requires innovative practices and policies to support extended careers, as well as collaboration between leaders and workers, to tackle challenges such as age bias and pension shortfalls. Engagement with all stakeholders on topics such as diversity, gender pay equity, income inequality, immigration, and climate change can lift financial performance and brand value. Many organisations are still catching up: 77% of respondents say that citizenship is important, but only 18% say this issue is a top priority reflected in corporate strategy. As employees demand that benefit programmes include physical, mental, financial, and spiritual health, in response employers are investing in such initiatives as both a societal responsibility and a talent strategy. More than 50% of respondents view such programmes as ‘valuable’ or ‘highly valuable’ to employees, but gaps remain between what employees value and what companies are delivering. Survey respondents predict tremendous future demand for skills such as complex problem-solving (63%), cognitive abilities (55%), and social skills (52%). To be able to maximise the potential value of technologies today, and minimise the potential adverse impacts on the workforce, organisations must put humans in the loop—reconstructing work, retraining people, and rearranging the organisation. 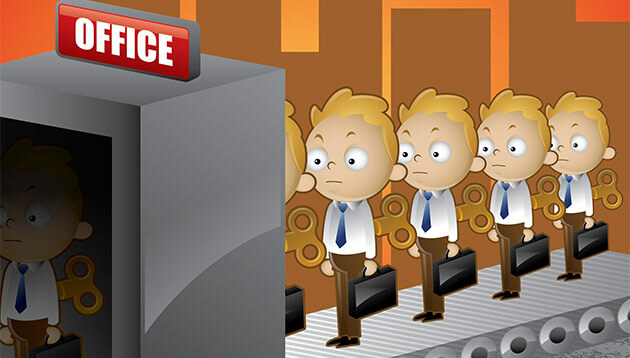 #9 The hyper-connected workplace: Will productivity reign? Seven in ten (70%) believe workers will spend more time on collaboration platforms in the future, 67% see growth in work-based social media, and 62% predict an increase in instant messaging. Organisations must apply their expertise in team management, goal-setting, and employee development to ensure that these tools actually improve performance and promote the collaboration to become a social enterprise. #10 People data: How far is too far? The rapid increase in people analytics tools have generated rich opportunities for HR and organisations — but they are also generating a variety of potential risks. While more than half of respondents are actively managing the risk of employee perceptions of personal data use, and a similar proportion is managing the risk of legal liability, only a quarter are managing the impact on their consumer brand. Organisations must develop a set of well-defined policies, security safeguards, transparency measures, and ongoing communication around the use of people data, or risk employee and societal backlash. Terence Wat, senior manager of L&D (corporate), for Belle Worldwide, shares the retailer's unconventional approach towards trainin..
Apple seems to have made a significant mark upon business students, after jumping 5 spots from last year to secure 2nd place in 20..